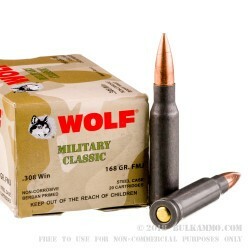 2745 feet per second velocity out of the barrel makes this ammunition plenty powerful and flat shooting for anything a different .308 load could do in a target shooting and plinking situation, It has also proven to be a very consistent load, so you can be assured your accuracy won’t suffer in normal conditions up to 150 yards. 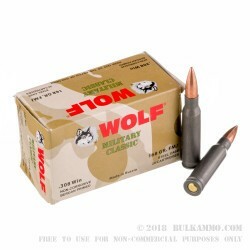 This Wolf cartridge is a steel cased, non-reloadable round, featuring a Berdan primer, which offers exceptional ignition characteristics, but generally requires heavy firing pin hits. 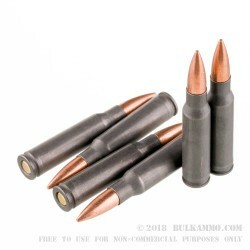 That said, the overall reception and consistency of this ammunition has been very good, showing that across the board, shooters are happy with it. The price point makes sense for those who shoot a lot of .308 Winchester and the alternatives don’t generally offer substantial enough benefits to pull buyer away from this as a practice or plinking round.